This Saturday we did our first workshop of sumorobot programming for girls. It took place during Robotex, the annual robotics competition, in the sports hall of Tallinn Technical University. We had 12 enthusiastic coders experimenting with programming on the Arduino based sumorobot kits. The goal was to stay inside the competition field while at the same time trying to push the opponent out of the sumo circle. The next workshop will take place on 1st of December at Teeviit. 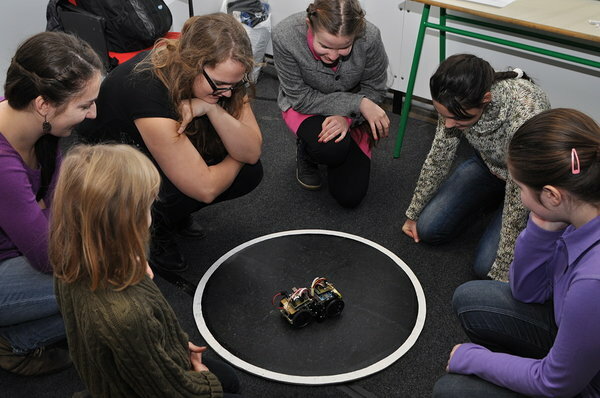 Thanks again to Estonian Information Technology College and their Robotics Club for the fantastic co-operation. Special thanks for helping out and carrying the thing through goes to Tiia Tänav, Reelika Lõhmus, Carolyn Fischer, Katrin Loodus, Mart Mangus and Janika Liiv. Pictures taken by Carolyn Fischer.